Council Directive 79/622/EEC of 25 June 1979 on the approximation of the laws of the Member States relating to the roll-over protection structures of wheeled agricultural or forestry tractors (static testing) (3) has been substantially amended several times (4). In the interests of clarity and rationality the said Directive should be codified. Directive 79/622/EEC is one of the separate Directives of the EC type-approval system provided for in Council Directive 74/150/EEC of 4 March 1974 on the approximation of the laws of the Member States relating to the type-approval of wheeled agricultural or forestry tractors, as replaced by Directive 2003/37/EC of the European Parliament and of the Council of 26 May 2003 on type-approval of agricultural or forestry tractors, their trailers and interchangeable towed machinery, together with their systems, components and separate technical units (5), and lays down technical prescriptions concerning the design and construction of agricultural or forestry tractors, as regards their roll-over protection structure (static testing). Those technical prescriptions concern the approximation of the laws of the Member States, to enable the EC type-approval procedure provided for in Directive 2003/37/EC to be applied in respect of each type of tractor. Consequently, the provisions laid down in Directive 2003/37/EC relating to agricultural or forestry tractors, their trailers and interchangeable towed machinery, together with their systems, components and separate technical units, apply to this Directive. mass of 800 kg or more, corresponding to the unladen mass of the tractor as referred to in point 2.1,1 of Annex I to Directive 2003/37/EC, including the roll-over protection structure fitted in compliance with this Directive and tyres of the largest size recommended by the manufacturer. 1. Each Member State shall grant EC component type-approval for any type of roll-over protection structure and its tractor attachment which satisfies the construction and testing requirements laid down in Annexes I to V.
2. A Member State which has granted EC component type-approval shall take the measures required to verify, in so far as is necessary and if need be in cooperation with the competent authorities in the other Member States, that production models conform to the approved type. Such verification shall be limited to spot checks. 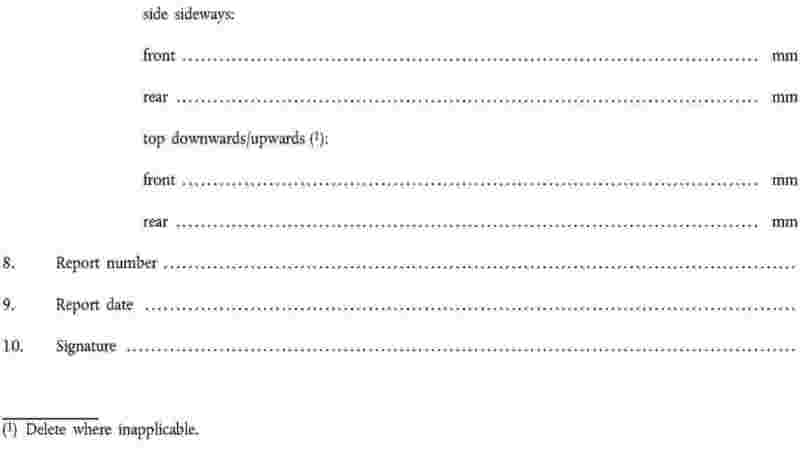 Member States shall, for each type of roll-over protection structure and its tractor attachment which they approve pursuant to Article 2, issue to the manufacturer of the tractor or of the roll-over protection structure, or to their respective authorised representatives, an EC component type-approval mark conforming to the model shown in Annex VI. Member States shall take all appropriate measures to prevent the use of marks liable to create confusion between roll-over protection structures which have been component type-approved pursuant to Article 2 and other devices. No Member State may prohibit the placing on the market of roll-over protection structures or their tractor attachments on grounds relating to their construction if they bear the EC component type-approval mark. Nevertheless, a Member State may prohibit the placing on the market of roll-over protection structures bearing the EC component type-approval mark which consistently fail to conform to the approved type. That Member State shall forthwith inform the other Member States and the Commission of the measures taken, specifying the reasons for its decision. The competent authorities of each Member State shall within one month send to the competent authorities of the other Member States copies of the component EC type-approval certificates, a model of which is shown in Annex VII, completed for each type of roll-over protection structure which they approve or refuse to approve. 1. If the Member State which has granted EC component type-approval finds that a number of roll-over protection structures and their tractor attachments bearing the same EC component type-approval mark do not conform to the type which it has approved, it shall take the necessary measures to ensure that production models conform to the approved type. The competent authorities of that Member State shall advise those of the other Member States of the measures taken which may, if necessary, where there is a serious and repeated failure to conform, extend to withdrawal of the EC component type-approval. Those authorities shall take the same measures if they are informed by the competent authorities of another Member State of such failure to conform. 2. The competent authorities of the Member States shall within one month inform each other of any withdrawal of EC component type-approval and of the reasons for any such measure. Any decision taken pursuant to the provisions adopted in implementation of this Directive to refuse or withdraw component EC type-approval for roll-over protection structures and their tractor attachments, or to prohibit their placing on the market or their use, shall set out in detail the reasons on which it is based. Such decision shall be notified to the party concerned, who shall at the same time be informed of the remedies available to him under the laws in force in the Member States and of the time limits allowed for the exercise of such remedies. 1. 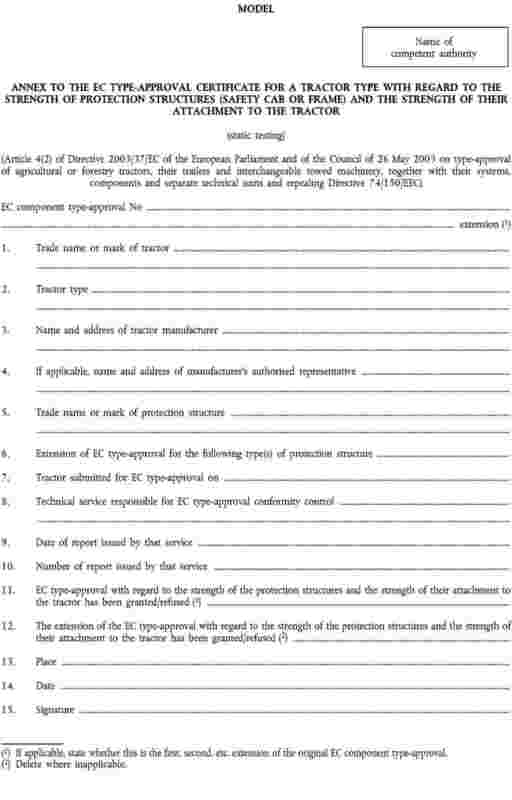 No Member State may refuse to grant EC type-approval, to issue the document provided for in Article 2(u) of Directive 2003/37/EC, or to grant national type-approval in respect of a type of tractor on grounds relating to the roll-over protection structures, if these satisfy the requirements set out in Annexes I to IX. 2. Member States may not issue the document provided for in Article 2(u) of Directive 2003/37/EC in respect of a type of tractor which does not meet the requirements of this Directive. Member States may refuse to grant national type-approval in respect of a type of tractor which does not meet the requirements of this Directive. No Member State may refuse to register or prohibit the sale, initial entry into service or use of any tractor on grounds relating to the roll-over protection structures if these satisfy the requirements set out in Annexes I to IX. For the purposes of EC type-approval, any tractor to which Article 1 refers must be fitted with a roll-over protection structure which satisfies the requirements laid down in Annexes I to IV. However, the tractors defined in Article 1 of Directive 2009/57/EC of 13 July 2009 of the European Parliament and of the Council on roll-over protection structures of wheeled agricultural or forestry tractors (6) may, for the purposes of EC type-approval, be fitted with a roll-over protection structure which satisfies the requirements laid down in Annexes I to IV of that Directive. Any amendments necessary to adapt to technical progress the requirements of Annexes I to IX shall be adopted in accordance with the procedure referred to in Article 20(3) of Directive 2003/37/EC. Directive 79/622/EEC, as amended by the acts listed in Annex X, Part A, is repealed, without prejudice to the obligations of the Member States relating to the time limits for transposition into national law of the Directives set out in Annex X, Part B.
References to the repealed Directive shall be construed as references to this Directive and shall be read in accordance with the correlation table in Annex XI. (1) OJ C 211, 19.8.2008, p. 17. (3) OJ L 179, 17.7.1979, p. 1. (4) See Annex X, Part A. (6) See page 1 of this Official Journal. 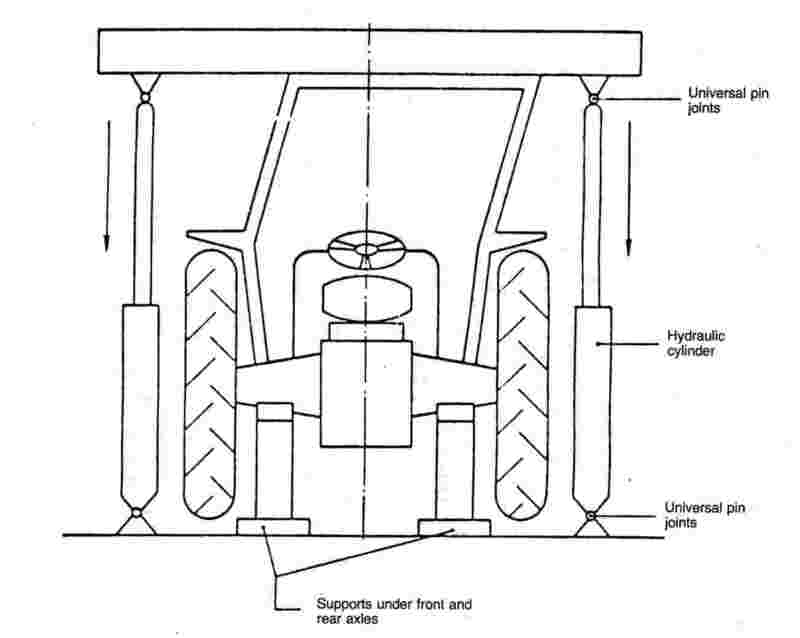 ‘Roll-over protection structure’ (safety cab or frame), hereinafter called ‘protection structure’, means the structure on a tractor the essential purpose of which is to avoid or limit risks to the driver resulting from roll-over of the tractor during normal use. The structures mentioned in point 1.1 are characterised by the fact that during the tests prescribed in Annexes II and III they ensure an unobstructed space inside them large enough to protect the driver. Every protection structure and its attachment to a tractor must be so designed and constructed as to fulfil the essential purpose laid down in point 1. This condition is considered to be fulfilled if the requirements of Annexes II and III are complied with. 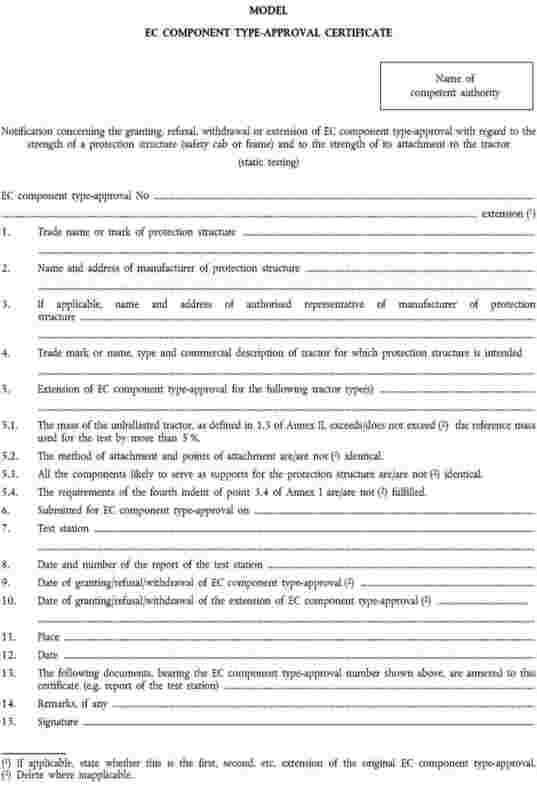 The application for EC component type-approval with regard to the strength of a protection structure and the strength of its attachment to a tractor shall be submitted by the tractor manufacturer or by the manufacturer of the protection structure or by their respective authorised representatives. details of materials used in structural parts including attaching brackets and fixing bolts (see Annex V). A tractor representative of the tractor type for which the protection structure to be approved is intended shall be submitted to the technical service responsible for conducting the component type-approval tests. This tractor shall be fitted with the protection structure. the position and critical dimensions of the seat in the protection structure and the relative positions of the protection structure and the tractor shall be such that the zone of clearance would have remained within the protection of the deflected structure throughout all tests. make and type(s) of tractor(s) for which the protection structure is intended. All these particulars must appear on a small plate. These markings must be visible, legible and indelible. Tests made using special rigs are intended to simulate such loads as are imposed on a protection structure, when the tractor overturns. These tests, described in Annex III, enable observations to be made on the strength of the protection structure and any brackets attaching it to the tractor and any parts of the tractor which transmit the test force. 1.2.1. The protection structure must conform to the series production specifications. It shall be attached in accordance with the manufacturer’s declared method of attachment to one of the tractors for which it is designed. A complete tractor is not required for the test; however, the protection structure and parts of the tractor on which it is attached for the tests shall represent an operating installation, hereinafter referred to as ‘the assembly’. 1.2.2. The assembly shall be secured to the bedplate so that the members connecting the assembly and the bedplate do not deflect significantly in relation to the protection structure under loading. The method of attachment of the assembly to the bedplate must not of itself modify the strength of the assembly. 1.2.3. The assembly must be supported and secured or modified so that all the test energy is absorbed by the protection structure and its attachment to the rigid components of the tractor. 1.2.3.1. To comply with the requirements of point 1.2.3, the modification shall lock any tractor ride suspension system so as to ensure that it does not absorb any of the test energy. 1.2.4. For the tests the tractor must be fitted with all structural components of the series production which may influence the strength of the protection structure or which may be necessary for the strength test. Components which may create a hazard in the zone of clearance must also be fitted so that they may be examined to see whether the requirements of point 4 have been fulfilled. All components that the driver could himself remove shall be removed for the tests. If it is possible to keep the doors and windows open or to remove them when the tractor is in use, they must be kept open or removed during the tests, so as not to increase the strength of the roll-over protection structure. If, in this position, they constitute a danger for the driver should the tractor roll over, the test report must refer to this fact. The reference mass mt, used in the formulae (see Annex III) to calculate the energies and the crushing force, shall be at least that defined in point 2.1.1 of Annex I to Directive 2003/37/EC (i.e. excluding optional accessories but including coolant, oils, fuel, tools and driver) plus the protection structure and less 75 kg. Not included are optional front or rear weights, tyre ballast, mounted implements, mounted equipment or any specialised components. 2.1.1. Material, equipment and tie-down means adequate to ensure that the assembly is firmly fixed to the bedplate, independently of tyres if present. 2.1.2. Means of applying a horizontal force on the protection structure by a stiff beam as shown in figures 1 and 2 of Annex IV. 2.1.2.1. 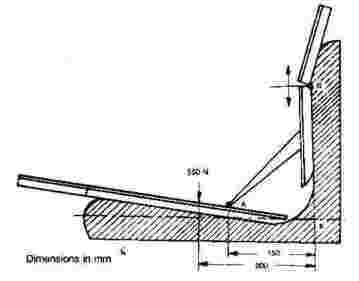 The stiff beam shall have a vertical face dimension of 150 mm. 2.1.2.2. Provision must be made so that the load can be uniformly distributed normal to the direction of loading and along a beam having a length of one of the exact multiples of 50 between 250 and 700 mm. 2.1.2.3. The edges of the beam in contact with the protection structure shall be curved with a maximum radius of 50 mm. 2.1.2.4. Universal joints — or the equivalent — shall be incorporated to ensure that the loading device does not constrain the structure in rotation or translation in any direction other than the direction of loading. 2.1.2.5. Where the horizontal length of the protection structure to which the load is to be applied does not constitute a straight line normal to the direction of application of the load, the space shall be packed so as to distribute the load over this length. 2.1.3. Equipment for measuring as far as is technically possible the energy absorbed by the protection structure and the rigid parts of the tractor to which it is attached, for example by measuring the force applied along its direction of application and the corresponding deflection relative to a point on the tractor chassis. 2.1.4. Means for proving that the zone of clearance has not been entered during the test. A rig according to figures 6a, 6b and 6c of Annex IV can be used. 2.2.1. Material, equipment and tie-down means adequate to ensure that the tractor is firmly fixed to the bedplate, independently of tyres. 2.2.2. 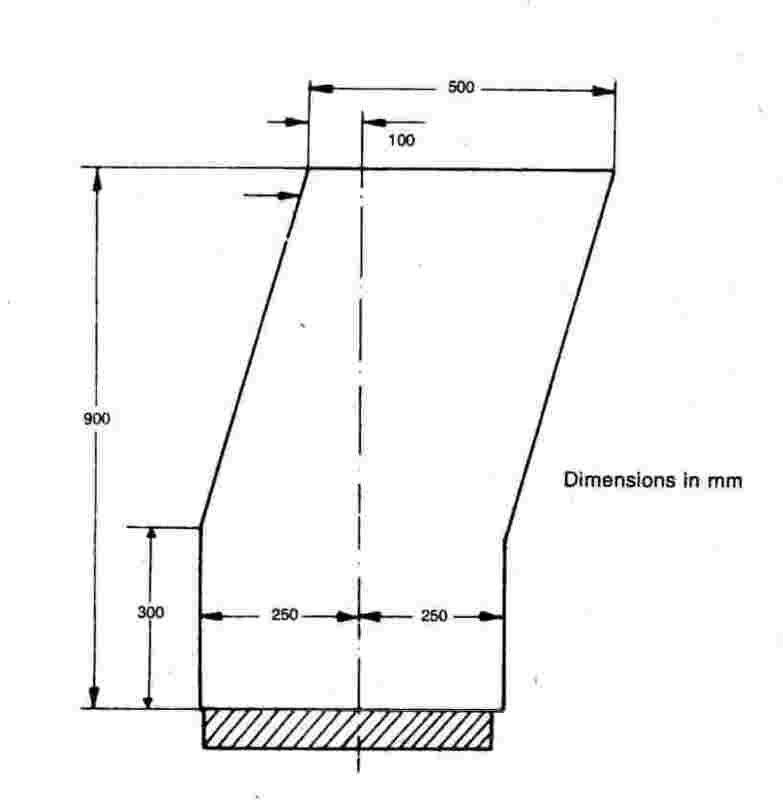 Means for applying a vertical force on the protection structure, such as shown in figure 3 of Annex IV, including a stiff crushing beam with a width of 250 mm. 2.2.3. Equipment for measuring the total vertical force applied. 2.2.4. Means for proving that the zone of clearance has not been entered during the test. A rig according to figures 6a, 6b and 6c of Annex IV can be used. 2.3.1. Dimensions: ± 3 mm. 2.3.2. Deflection: ± 3 mm. 2.3.3. Tractor mass: ± 20 kg. 2.3.4. Loads and forces: ± 2 %. during test, under load: 10° above and 20° below the horizontal. These variations shall as far as possible be kept to a minimum. For tractors with at least 50 % of the mass as defined in point 1.3 on the rear wheels the longitudinal loading shall be applied from the rear (case 1). For other tractors the longitudinal loading shall be applied from the front (case 2). at the front in case 2 (Annex III, point 1.6). at the rear in case 2 (Annex III, point 1.5). A second longitudinal loading shall be applied to tractors fitted with a protection structure designed to be tilted when the direction of application of the longitudinal loading (see point 3.1.1.1.1) would not have tilted the protection structure. 3.1.1.2. If, during the test, any part of the restraining equipment breaks or moves, the test shall be re-started. 3.1.1.3. No repairs or adjustments to the tractor or protection structure may be carried out during the tests. The wheels shall be removed or set at a track width setting which ensures that no interference can occur with the protection structure during the tests. All components of the tractor and protection structure which, as complete units, constitute protection for the driver — including weather protection — shall be supplied complete on a tractor for inspection. The protection structure to be tested need not be fitted with front, side or rear windows of safety glass or similar material, or with any detachable panels, fittings and accessories, which have no function of structural strength and which cannot create a hazard in the event of overturning. The protection structure shall be instrumented with the necessary equipment to obtain the data required to draw the force-deflection diagram (see figure 4 of Annex IV). Total and permanent protection structure deflection shall be measured and noted for each stage of the test (see figure 5 of Annex IV). In the case of a tractor whose seat is not on the median plane of the tractor and/or non-symmetrical strength of the structure, the side loading shall be on the side most likely to lead to infringement of the zone of clearance during the tests (see also Annex III, point 1.3). No part of the zone of clearance as described in point 3.2 of Annex III has been entered by, or has been outside the protection of, the protection structure during the tests specified in points 1.2, 1.3, 1.5, 1.6 and, where appropriate, point 1.7 of Annex III. If an overload test has been carried out, the force applied when the specified energy is absorbed shall be greater than 0,8 of the maximum force occurring during both the main test and the overload test concerned (see figures 4b and 4c of Annex IV). During the tests the protection structure must not impose any constraint on the seat structure. At the point when the required energy level is attained in each of the specified horizontal loading tests, the force shall exceed 0,8 Fmax. 4.2. In addition there shall be no other feature presenting a particular hazard to the driver, for example insufficient padding inside the roof or anywhere else where the driver’s head may strike. A general description of the protection structure’s shape and construction (see Annex V for the obligatory dimensions), including the provisions for normal entry, exit and escape; the provisions for the heating and ventilation system, and other accessories where these are available and where they could affect the zone of clearance or might create a hazard. Details of any special features such as devices to prevent the continuous rolling of the tractor. A brief description of any interior padding. A statement of the type of windscreen and glazing fitted and of any EC or other approval marking incorporated. 5.2. If EC component type-approval is being extended for other tractor types, the report must include the exact reference of the report of the original EC component type-approval as well as precise indications regarding the requirements laid down in point 3.4 of Annex I. 5.3. The report must identify clearly the tractor type (make, type and commercial description, etc.) used for testing and the types for which the protection structure is intended. reference tractor mass (kg), as defined in point 1.3.
deflection (mm) of structure at the point of and in line with the load application. deflection (mm) of structure for the calculated energy required. 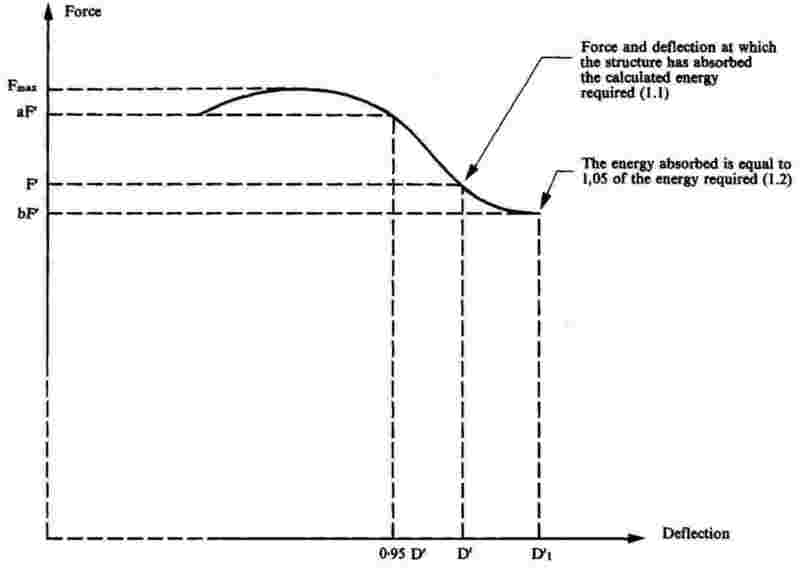 static load force (N) (newtons). maximum static load force occurring during loading, (N) with the exception of the overload. force for the calculated energy required. energy input to be absorbed during side loading (J) (joules). energy input to be absorbed during longitudinal loading (J). energy input to be absorbed during application of the second longitudinal load (J). applied force at rear in the crushing test (N). applied force at front in the crushing test (N). 1.1.1. 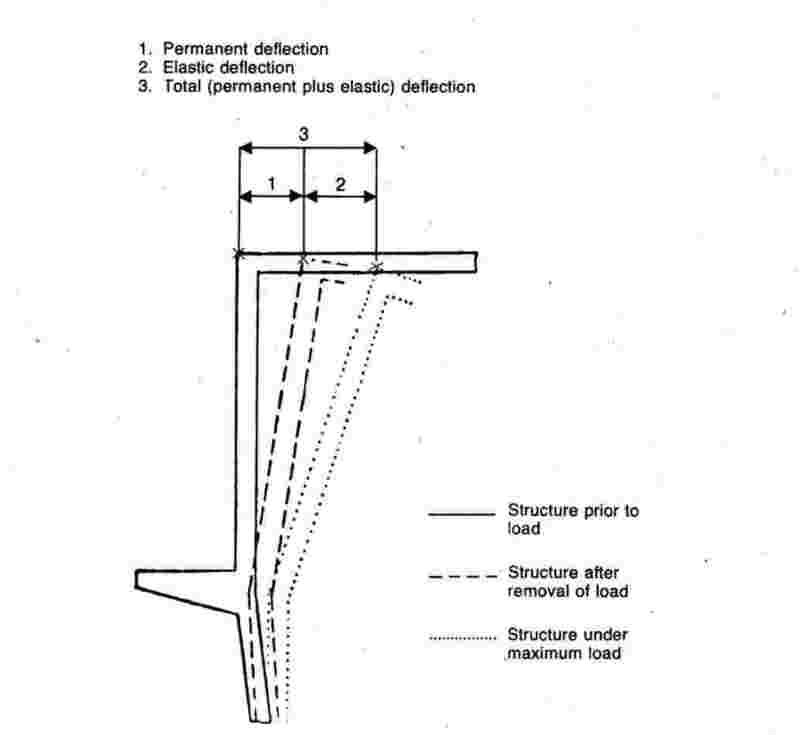 The loads applied to the protection structure shall be distributed by means of a stiff beam, complying with the specifications laid down in point 2.1.2 of Annex II, located normal to the direction of load application; the stiff beam may be equipped with a means of preventing its being displaced sideways. The rate of deflection under loading shall not be greater than 5 mm/s. As the load is applied, the values F and D shall be recorded simultaneously at deflection increments of 15 mm or less, to ensure accuracy. Once the initial application has commenced, the load shall not be reduced until the test has been completed; but it is permitted to cease increasing the load if desired, for example to record measurements. 1.1.2. 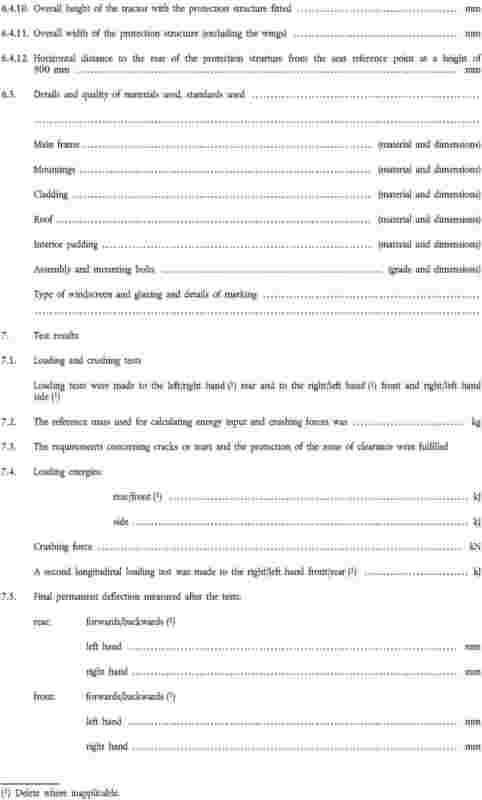 If the structural member to which the load is to be applied is curved, the specifications laid down in point 2.1.2.5 of Annex II must be complied with. The application of a load must, however, comply with the requirements of point 1.1.1 above and point 2.1.2 of Annex II. 1.1.3. If no structural cross member exists at the point of application, a substitute test beam which does not add strength to the structure may be utilised for the test procedure. 1.1.4. The structure shall be inspected visually when the load is removed after each loading test has been completed. If cracks or tears have occurred during loading, the overload test specified in point 1.4 below shall be carried out before proceeding to the next loading in the sequence given in point 3.1.1.1 of Annex II. Load application shall be horizontal and parallel to the vertical median plane of the tractor. For tractors with at least 50 % of their mass, as defined in point 1.3 of Annex II, on the rear wheels, the longitudinal rear load and the lateral load shall be applied on different sides of the median longitudinal plane of the protection structure. For tractors with at least 50 % of their mass on the front wheels, the longitudinal front load shall be on the same side of the median longitudinal plane of the protection structure as the lateral load. It shall be applied to the uppermost transverse structural member of the protection structure (i.e. the part which would be likely to strike the ground first in an overturning incident). The point of application of the load shall be located one-sixth of the width of the top of the protection structure inwards from the outside corner. The width of the protection structure shall be taken as the distance between two lines parallel to the vertical median plane of the tractor touching the outside extremities of the protection structure in the horizontal plane touching the top of the uppermost transverse structural members. The length of the beam shall be not less than one-third of the width of the protection structure (as previously described) and not more than 49 mm greater than this minimum. The longitudinal loading is applied from the rear or front, as defined in point 3.1.1.1 of Annex II. the structure infringes the zone of clearance or leaves the zone of clearance unprotected. The loading shall be applied horizontally at 90° to the vertical median plane of the tractor. 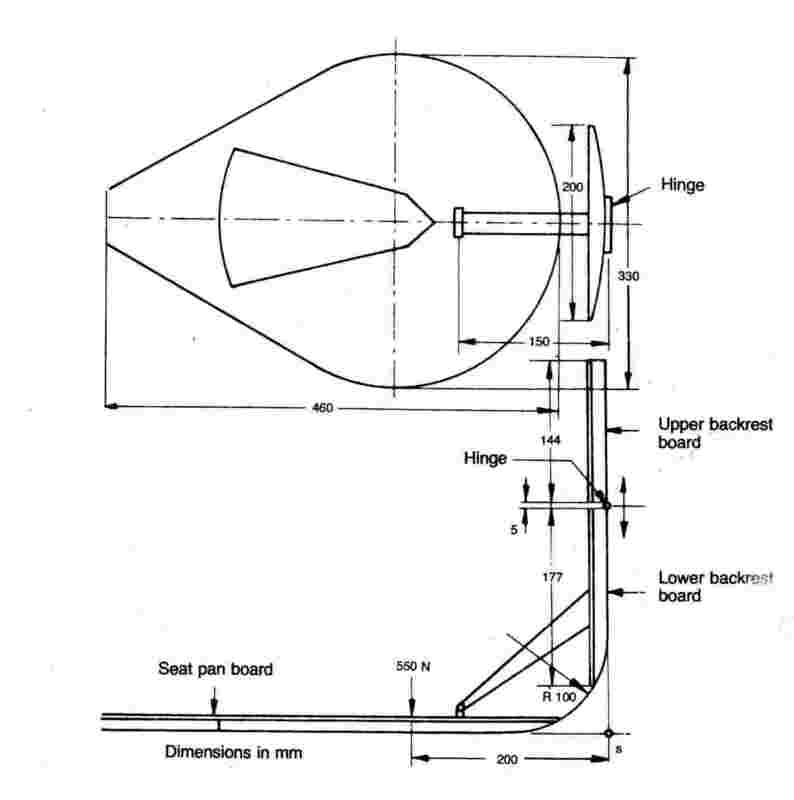 It shall be applied to the upper extremity of the protection structure at a point 300 mm forward of the seat reference point with the seat in its rearmost position (see point 2.3.1). If the protection structure has any projection on the side which would be certain to contact the ground first during a sideways overturn, the loading shall be applied at that point. In the case of a tractor with a reversible position, the load shall be applied to the upper extremity of the roll-over protection structure half-way between the two seat reference points. The beam shall be as long as practicable, but no more than 700 mm in length. 1.4.1. 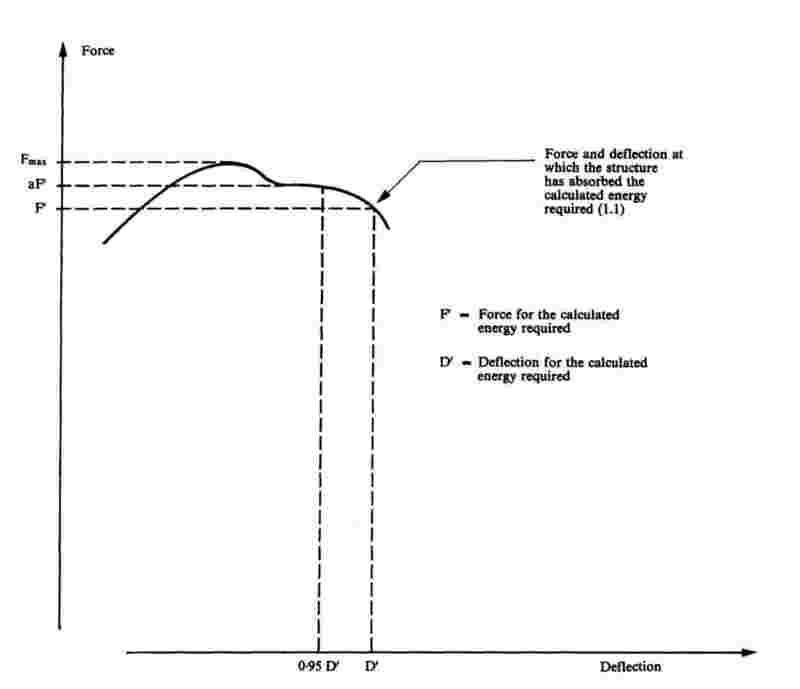 The overload test must be carried out if the force decreases by more than 3 % during the last 5 % of the deflection achieved, where the energy required is absorbed by the structure (see figure 4b). 1.4.2. 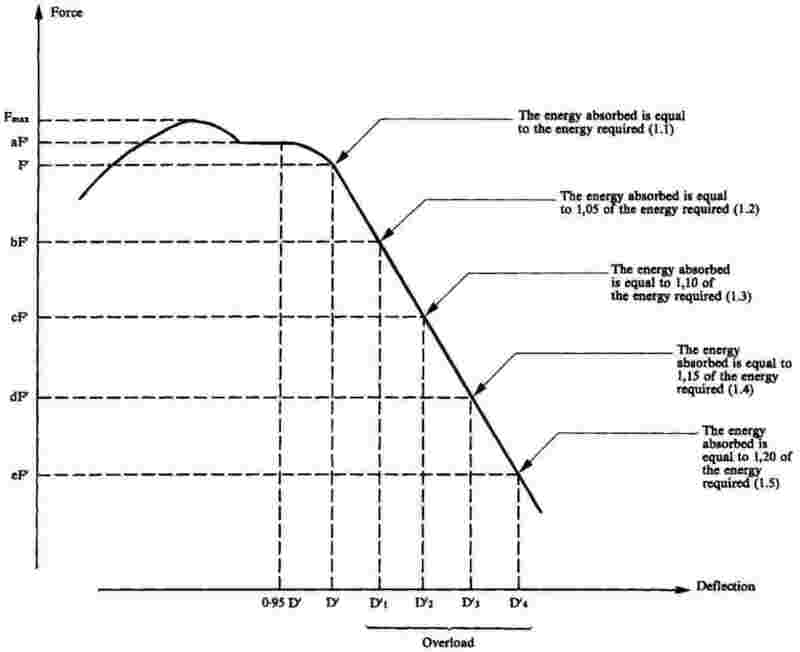 The overload test involves the gradual increase of the horizontal load by increments of 5 % of the initial energy requirement up to a maximum of 20 % of energy added (see figure 4c). 1.4.2.1. The overload test is satisfactory if, after each increase by 5 %, 10 % or 15 % in the energy required, the force decreases by less than 3 % for a 5 % increment and remains more than 0,8 Fmax. 1.4.2.2. The overload test is satisfactory if, after the structure has absorbed 20 % of the added energy, the force exceeds 0,8 Fmax. 1.4.2.3. Additional cracks or tears and/or entry into or lack of protection of the zone of clearance due to elastic deformation are permitted during the overload test. However, after the removal of the load, the structure shall not enter the zone of clearance, which shall be completely protected. The beam shall be positioned over the rear uppermost structural members and the resultant of crushing forces shall be located in the vertical longitudinal reference plane. A force Fr = 20 mt shall be applied. Where the rear part of the protection structure roof will not sustain the full crushing force, the force shall be applied until the roof is deflected to coincide with the plane joining the upper part of the protection structure with that part of the rear of the tractor capable of supporting the vehicle’s mass when overturned. The force shall then be removed, and the tractor or loading force repositioned so that the beam is over that point of the protection structure which would then support the tractor when completely overturned. The force Fr shall then be applied. The force Fr shall be applied for a minimum of five seconds following the cessation of the visually detectable deflection. The test shall be stopped if the structure infringes the zone of clearance or leaves the zone of clearance unprotected. The beam shall be positioned across the front uppermost structural members and the resultant of crushing forces shall be located in the vertical longitudinal reference plane. A force Ff = 20 mt shall be applied. Where the front part of the protection structure roof will not sustain the full crushing force, the force shall be applied until the roof is deflected to coincide with the plane joining the upper part of the protection structure with that part of the front of the tractor capable of supporting the vehicle’s mass when overturned. The force shall then be removed, and the tractor or loading force repositioned so that the beam is over that point of the protection structure which would then support the tractor when completely overturned. The force Ff shall then be applied. The force Ff shall be applied for a minimum of five seconds following the cessation of the visually detectable deflection. Load application shall be horizontal parallel to the vertical median plane of the tractor. The second longitudinal loading is applied from the rear or front as defined in point 3.1.1.1 of Annex II. It shall be applied in the opposite direction to and at the corner furthest from the longitudinal loading in point 1.2. It shall be applied to the uppermost transverse structural member of the protection structure (i.e. that part which would be likely to strike the ground in an overturning incident). 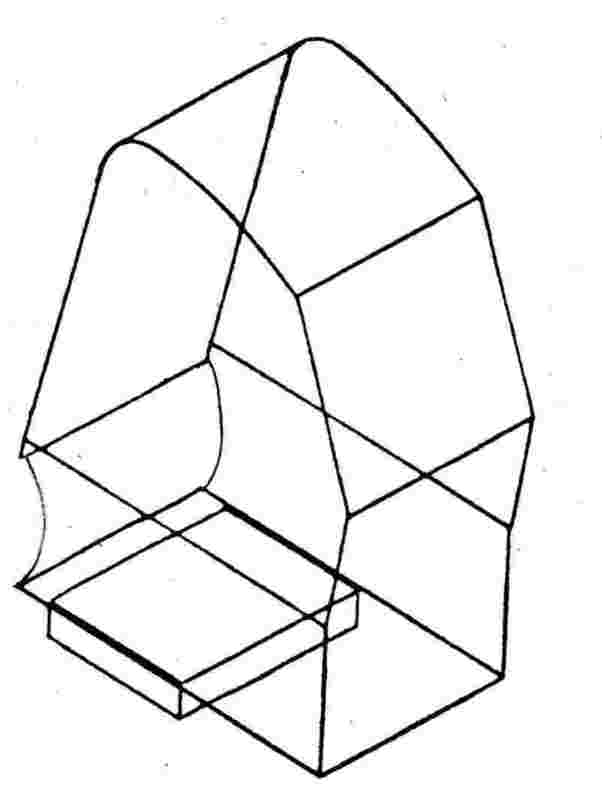 The point of application of the load shall be located one sixth of the width of the top of the protection structure inwards from the outside corner. The width of the protection structure shall be taken as the distance between two lines parallel to the vertical median plane of the tractor touching the outside extremities of the protection structure in the horizontal plane touching the top of the uppermost transverse structural members. The length of the beam shall be not less than one third of the width of the protection structure (as previously described) and not more than 49 mm more than this minimum. 2.1. 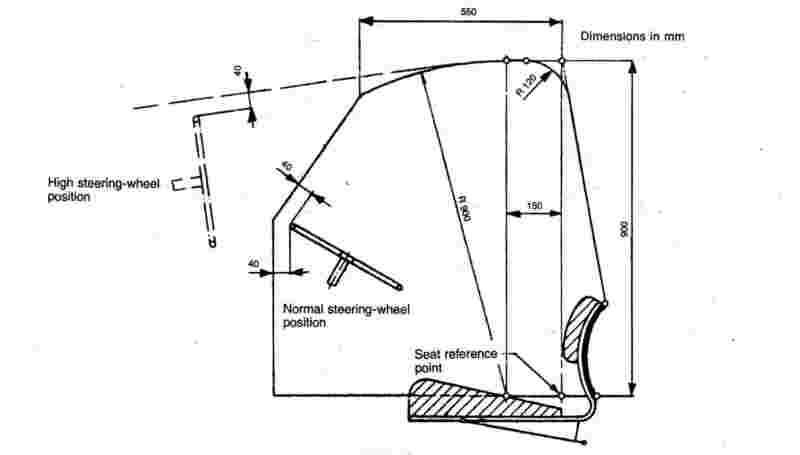 The zone of clearance is illustrated in figure 6 of Annex IV and is defined in relation to a vertical reference plane generally longitudinal to the tractor and passing through a seat reference point, described in point 2.3, and the centre of the steering wheel. The reference plane shall be assumed to move horizontally with the seat and steering wheel during application of the load but to remain perpendicular to the floor of the tractor or of the protection structure if this is resiliently mounted. Where the steering wheel is adjustable, its position shall be that for normal seated driving. 2.2.13. where a new seat option is proposed after the test has taken place, a calculation shall be made to determine whether the clearance around the new seat reference point is located entirely within the clearance previously established. If this is not the case, a new test shall be required. 2.3.1. For the purpose of defining the zone of clearance in point 2.1 the seat shall be at the rearmost point of any horizontal adjustment range. It shall be set at the highest point of the vertical adjustment range where this is independent of adjustment of its horizontal position. 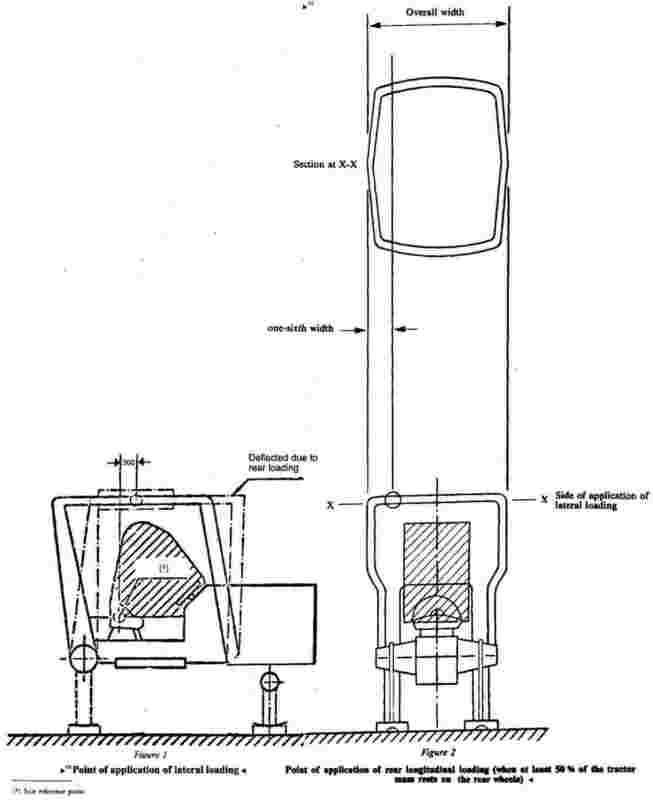 The reference point shall be established using the apparatus illustrated in figures 7 and 8 of Annex IV to simulate loading by a human occupant. The apparatus shall consist of a seat pan board and backrest boards. The lower backrest board shall be jointed in the region of the ischium humps (A) and loin (B), the joint (B) being adjustable in height. 2.3.2. The reference point is defined as the point in the median longitudinal plane of the seat where the tangential plane of the lower backrest and a horizontal plane intersect. This horizontal plane cuts the lower surface of the seat pan board 150 mm in front of the abovementioned tangent. 2.3.3. Where a seat incorporates a free sprung suspension travel, whether or not this can be adjusted for the weight of the driver, the seat shall be set at the mid-point of this travel. The apparatus shall be positioned on the seat. It shall then be loaded with a force of 550 N at a point 50 mm in front of joint (A), and the two parts of the backrest board shall be lightly pressed tangentially against the backrest. where no definite tangent to the upper area is possible, the joint (B) is fixed at a height which is 230 mm above the seat reference point, if the lower part of the backrest board is vertical. Then the two parts of the backrest board are lightly pressed against the backrest. During each test the protection structure shall be examined to see whether any part of the protection structure has entered a zone of clearance round the driving seat as defined in point 2.1. In addition, the protection structure shall be examined to determine whether any part of the zone of clearance is outside the protection of the protection structure. For this purpose, it shall be considered to be outside the protection of the protection structure if any part of it would have come into contact with flat ground if the tractor had overturned towards the direction from which the loading was applied. For this purpose, the tyre and track setting shall be assumed to be the smallest specified by the manufacturer. After the tests, the final permanent deflection of the protection structure shall be recorded. For this purpose, before the start of the test, the position of the main protection structure members in relation to the seat reference point shall be recorded. 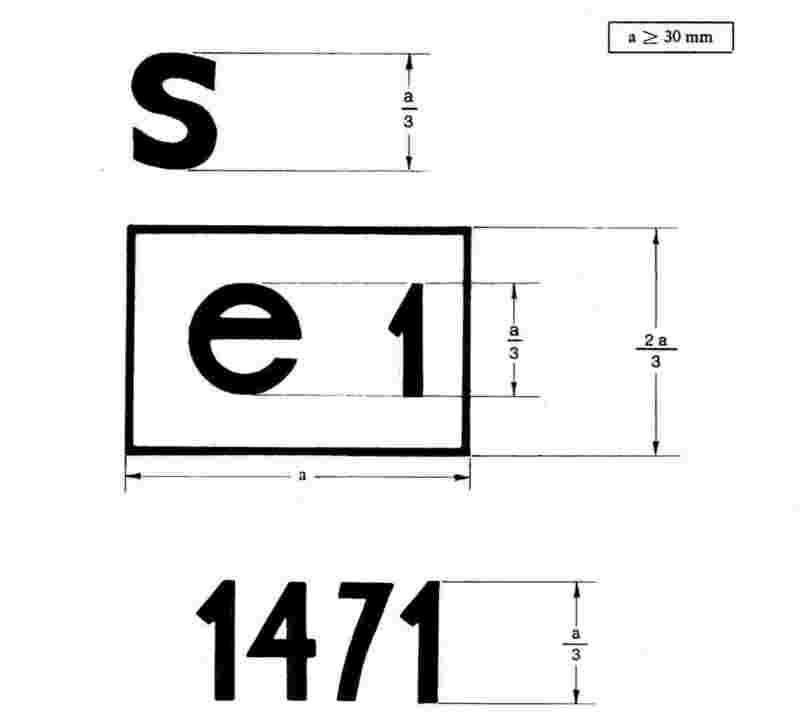 It must also include in the vicinity of the rectangle the EC component type-approval number which corresponds to the number of the EC component type-approval certificate issued with regard to the strength of the type of protection structure and its attachment to the tractor. The application for EC type-approval of a tractor, with regard to the strength of a protection structure and the strength of its attachment to the tractor, shall be submitted by the tractor manufacturer or by his authorised representative. A tractor representative of the tractor type to be approved, on which a protection structure and its attachment, duly approved, are mounted, shall be submitted to the technical services responsible for conducting the type-approval tests. The technical service responsible for conducting the type-approval tests shall check whether the approved type of protection structure is intended to be mounted on the type of tractor for which the type-approval is requested. In particular, it shall ascertain that the attachment of the protection structure corresponds to that which was tested when the EC component type-approval was granted. The holder of the EC type-approval may ask for its extension for other types of protection structures. the attachment of the protection structure to the tractor corresponds to that which was tested when EC component type-approval was granted. A certificate, of which a model is shown in Annex IX, shall be annexed to the EC type-approval certificate for each type-approval or type-approval extension which has been granted or refused. 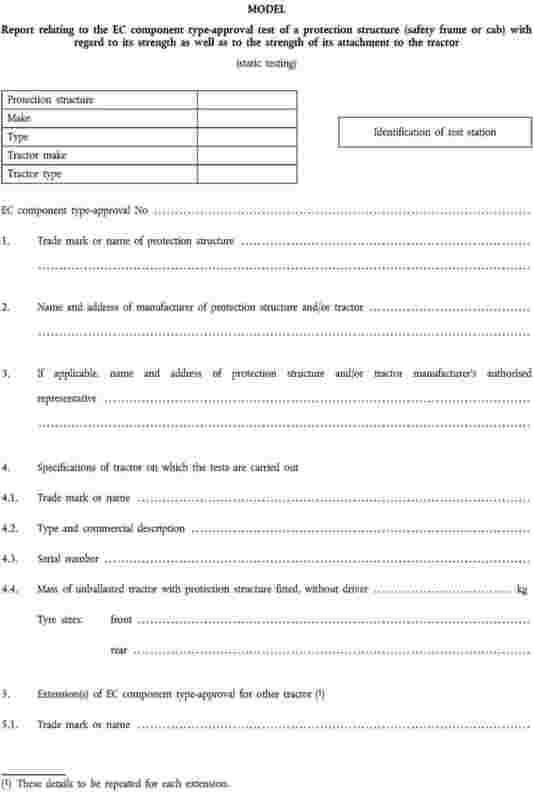 If the application for EC type-approval for a type of tractor is introduced at the same time as the request for EC component type-approval for a type of protection structure intended to be mounted on the type of tractor for which EC type-approval is requested, the checks laid down in points 2 and 3 shall not be made. if the roll-over protection structure for this type of tractor or these tractors complies with the provisions of this Directive. may refuse to grant national type-approval in respect of a type of tractor on which the rollover protection structure does not comply with the provisions of this Directive. 3. With effect from 1 October 1985, Member States may prohibit the entry into service of tractors on which the roll-over protection structure does not comply with the provisions of this Directive. 4. The provisions of paragraphs 1 to 3 shall be without prejudice to the provisions of Directive 77/536/EEC.’. if the roll-over protection structures of this type of tractor or tractors comply with the provisions of this Directive. may refuse to grant national type-approval in respect of a type of tractor, the roll-over protection structure of which does not comply with the provisions of this Directive.’. if the tractors in question meet the requirements of Directive 79/622/EEC, as amended by this Directive. may refuse to grant national type-approval in respect of any type of tractor which does not meet the requirements of Directive 79/622/EEC, as amended by this Directive.’.